Q-Tips sent me some Precision Tip Q-Tips and I love them! They are much smaller which I found very useful when cleaning up makeup smudges. There is nothing I hate more than to get a little bit of mascara on my lid after I applied my eyeshadow. The Precision tips took care of the clean up without the need for me to reapply my eyeshadow! AWESOME! I also used the Precision Tips to help me dust my keyboard! It was so efficient and easy. What do you like to do with your Q-Tips? Enter your tips by the end of the day today on www.facebook.com/Qtips for your chance to win a $100 gift card. 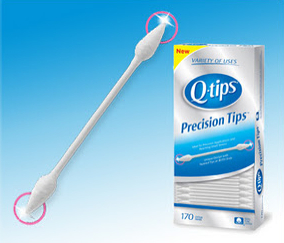 These new Qtips look great! They will help in fixing my daughter's make up for dance, and I never thought of using them to help clean the keyboard. Great idea!